When you live in a colder climate that has a lengthy and oftentimes extended winter season, summer is one of those things that warrants celebration and elaborate shows of appreciation. Our “Yippie culture” (I say with a smirk and nod to my nerd-iness) dictates a fun combination of nature and high-brow entertaining. Thus, our annual Summer Solstice Wine Pairing dinner. 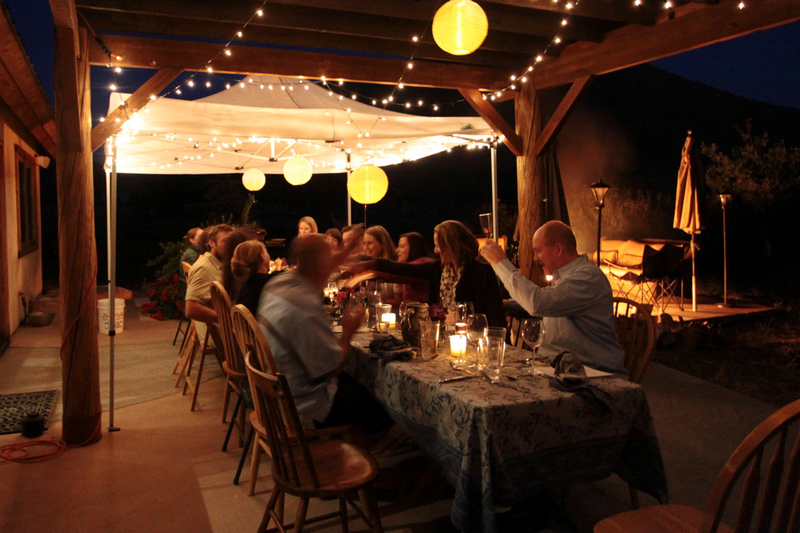 This now fully ingrained ritual in our household means preparing a 7-course dinner, designed around local foods currently in season and available from Idaho’s Bounty (as much as possible), with carefully thought out wine pairings, for 16-20 of our best friends. Guests help by bringing wines chosen with sometimes vague and sometimes specific requests for the courses. Some lucky ones get to partake of the excitement in the kitchen by helping chop, flip, slice, and more! We serve the meal outside (when the weather cooperates), complete with a bonfire on the patio to be enjoyed between courses and into the night, once the sun finally sets on the longest days of the year. This year, our 4th annual celebration, the weather behaved perfectly. It was quite a nice counterpoint to last year’s rain-out where we had to move the very very long tables into our teeny teeny house. Over the next few weeks, I’ll be sharing some of the highlights from the menu on this blog. (If you haven’t figured it out already, this is an evening that entails a general suspension of many of our normal diet rules–it’s a go nuts, full-on, eat your heart out party!) I hope you enjoy and take time to say thanks to the sun for bringing us this glorious season and all the amazing sustenance it offers! Mix first 4 ingredients in a shaker with ice. Pour over ice in a highball glass and top with the Pelligrino. Serve with a small slice of grapefruit and/or a sprinkle of a few lavender flowers. *Lavender Infused Vodka: I used a liter of Grey Goose vodka and added 1/4 cup dried lavender flowers (use fresh if you have them!) to the bottle. After 3 days, there was plenty of lavender flavor. Keep you eyes peeled for the next installment… Walnut Ricotta Bruschetta with Arugula, Asparagus, & Crème Fraiche. Yum! This entry was posted in Cocktails, Recipes and tagged Apertif, Grapefruit, Lavender, St. Germain, Summer Solstice, Wine Pairing by Brooke Bonner. Bookmark the permalink.